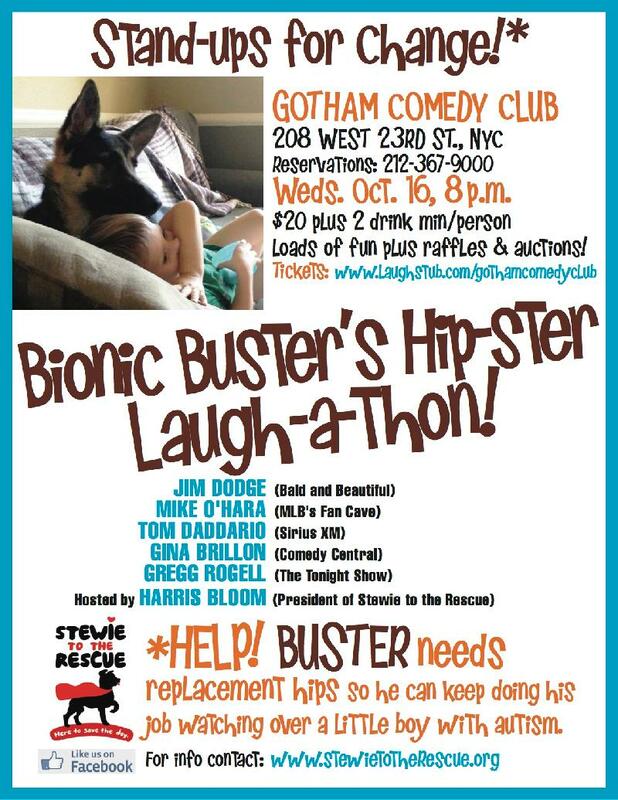 Gotham Comedy Club :: Stewie to the Rescue! Stewie helps to bring affordable spay and neuter services, wellness services, and emergency and surgical care to pet owners who otherwise would not be able to afford even the most routine and essential veterinary visits. Stewie also helps animal rescues save more lives, by providing funding for animal rescue groups to get animals out of the NYC shelter system and into homes. Stewie eases the burden on rescues by helping with expenses such as veterinary care, obedience or remedial dog training, even emergency boarding while a rescued pet waits for a foster or finds their forever home. Buster is a very special dog, to a very special boy. Buster was brought into the Boothe family a year ago as a therapy dog for their son with developmental disabilities. Within months, even weeks, it was obvious he was making a difference.